Whew. I know it is just Monday, but I already feel as though I have had a marathon week. These last few weekends have flown by, more hectic than relaxed, and I am feeling the effect. The busyness of it all is mostly with happy tasks, thank goodness; the sort of work that is wholly gratifying, but not always easy. Renovations, projects, an almost-four-month-old delight who believes that he is grown up enough to debut his first two teeth, a most wonderfully-mischievous toddler, friends, baking, cooking, planning, organizing, birthdays ... I'll say it again. Whew. Tomorrow a dear, dear loved one will jet off for a faraway land for an extended trip. As exciting as that is, the last few days have been abuzz with expectant, frenetic energy as we all aid in preparations for departure and simultaneously prepare ourselves for three weeks of missing someone terribly. I am looking ahead though; this weekend is Canadian Thanksgiving, and there is cooking to be done. Although this year we are not hosting the festivities, we are contributing to the celebration. I am thinking of doing David Lebovitz's showstopping Spiced Pumpkin Cheesecake with Caramel Bourbon Sauce. Jim Lahey's No Knead Bread has been requested, and I might pack a tin of Pecorino Crackers from Giada De Laurentiis (these are featured in De Laurentiis' new book; look out for my review next week). My only decision left is to settle on a cranberry sauce to make. With all of this going on, I want something quick I can nibble while doing any number of other things through my day. And so, with a bit of time to throw together something, I turned to my favourite snack for these sort of days - granola bars. Far from the overly-cloying packaged versions that verge on candy bar status, these little offer a bit of salty and sweet; as well-suited for breakfast with coffee as they are as a mid-afternoon bite all on their own. Delicious and portable, a balance of nutrition with a bit of treat, multitasking has never been as appealing than this. Endnote: I feel compelled to mention that Thanksgiving is my favourite holiday; in fact, this time of year is my absolute, preferred season. All of this is a wonderful sort of busy, and though I might wish for more hours in the day sometimes, I would not wish away a second of it. My version of a base recipe from Alton Brown. By adding the cashews at the end their salt does not get fully mixed into the bars, resulting in little pockets of salty goodness. Butter a 9 by 9-inch baking dish and set aside. Preheat the oven to 350°F (175°C). 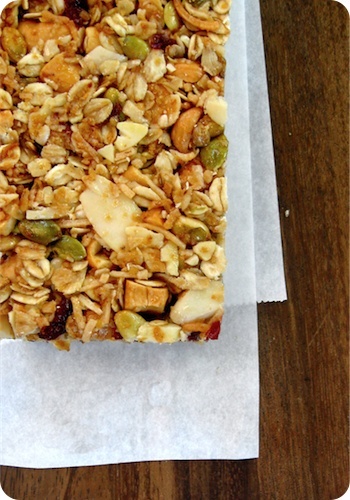 Spread the oats, wheat germ, flax seed, pumpkin seeds, almonds, and coconut onto a baking sheet. Place in the oven and toast for 15 minutes, tossing to toast evenly. Meanwhile, combine the honey, golden syrup, brown sugar, and butter in a large, microwave-safe bowl. Heat, on a low setting, stirring occasionally. Once the sugar is completely dissolved, stir in the salt and vanilla extract. When the oat mixture is lightly toasted, remove it from the oven and reduce the heat to 300°F (150°C). Quickly add the oat mixture to the sugars, then the dried fruit and nuts, stirring to fully combine and coat. Pour mixture into the prepared baking dish. Using the back of a greased spatula, press and flatten the mixture until evenly distributed. Bake in the preheated oven for 25 minutes, rotating once during baking. Remove from the oven to a rack and allow to cool completely. Turn out onto a cutting board and slice into desired squares or bars. Store in an airtight container at room temperature for up to a week. Makes one 9x9 inch pan. I put a second baking dish of the same size on top of the bars as they come out of the oven, weighted down with cans. This extra compression makes for bars that will cut easily and hold their shape. For a crisp bar, allow the pan to completely cool before removing the weights. If you prefer a softer bar, you can do this for only part of the cooling time, or skip the step entirely. In my mind, the perfect portion of these is achieved by cutting the pan into 2 1/4" squares. This yields 16 small bars. Obviously, this is a recipe that can easily be tailored to suit personal preferences; as long as the general ratio of liquids to solids remains, sensible substitutions are easily made.